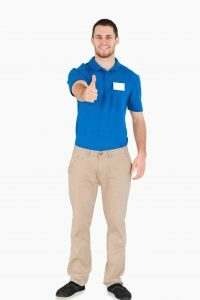 Tips For Designing Your Employee Uniforms | Ace Uniform Services, Inc.
Give careful thought and consideration into your employee uniforms. There should be careful thought and consideration when designing your employee uniforms. They serve a multitude of purposes and shouldn’t just be an afterthought. It is important to remember that your employee uniforms are a reflection on your business. With that said, here are some important aspects to consider when you are designing your employee uniforms. This should be near the top of your priority list when designing your employee uniforms. You don’t want to create outfits that will hinder your employee’s performance at work. If possible, the uniforms should be able to make their jobs easier. For example, if you own a landscaping company, it is in your best interest to choose a lightweight material for the uniforms. You don’t want your employees always be overheated whenever they are on the job. If you are a business owner or a manager, you need to listen to your employees. In most cases, they will have no trouble providing you with feedback and suggestions of their own. It is a good idea to survey your employees to see what they would like to wear to work every day. If they are comfortable and happy, they will probably perform better on the job. By asking your employees for their input will also show your team that you value their opinion. They will feel appreciated that they have a say in an important business decision like this. This entry was posted on Friday, July 28th, 2017	at 8:38 am	. You can follow any responses to this entry through the RSS 2.0	feed. Both comments and pings are currently closed.